65 years after a young Elvis walked into the offices of Sun Records with a guitar and a dream, the spirit of the King of Rock n’ Roll is kept alive by one of the most successful tributes of all time. The Elvis Years is taking the UK by storm after celebrating the 10-year anniversary tour, and 2018 will be the biggest year yet! 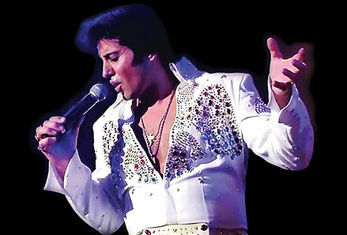 The Elvis Years is a concert production telling the story of Elvis through the years. The show features original lead of Jailhouse Rock in the West End Mario Kombou and his incredible band, and is led by the award-winning, legendary producer and musical director David Mackay. With a world class cast, authentic costumes and rare film footage, The Elvis Years features more than 50 of the King’s greatest hits including ‘Hound Dog’, ‘It’s Now or Never’, ‘Suspicious Minds’ ‘American Trilogy’ and many more, as well as lesser known tracks such as ‘Rock A Hula Baby’ and ‘Bossa Nova Baby’. Experience the incredible story of the King of Rock n’ Roll, from the young truck driver, to the world-wide phenomenon. For fans of Elvis and his music, there is no better tribute to the King. Coming to King's Hall, Ilkley on Tuesday 14 June.